This was to be 20th Century-Fox chief Darryl F Zanuck's finest hour: he personally produced this lengthy biopic about Woodrow Wilson, America's 28th president, who founded the League of Nations. Ultimately, though, despite his chronic idealism, the great man is a boring subject for a movie. Apart from winning five Oscars, the only thing really impressive about Wilson is that it was made at all. Alexander Knox is a resolutely uncharismatic lead, and, despite the award-winning Technicolor photography of Leon Shamroy, there's precious little to look at, it all seems like idle chat. The public stayed away in droves. 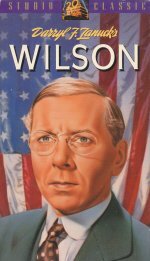 Nobody ever really cared about Wilson, nor about this doorstop of a movie.